JD Edwards EnterpriseOne is a complex application that provides Enterprise Resource Planning (ERP), Supply Chain Management (SCM), and Customer Relationship Management (CRM) capabilities. It can run with Citrix, fat, or Web clients. This IBM Redbooks publication provides helpful hints as you work with the EnterpriseOne product on iSeries. 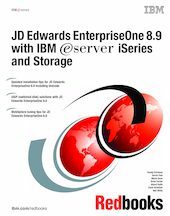 The reader of this book should have a basic knowledge of IBM eServer iSeries and the JD Edwards EnterpriseOne solution. This book is designed to assist technical people among J.D. Edwards OneWorld customers, OneWorld consultants, business partners, and IBM service representatives. It targets professionals who are directly involved with the implementation of a total business solution, consisting of iSeries server hardware, OS/400, DB2 UDB for iSeries database, OneWorld solutions, and supplemental solution products. You should use this book in conjunction with J.D. Edwards OneWorld Implementation for AS/400, SG24-5195. This publication explains detailed concepts and all implementation steps of earlier versions of OneWorld, most of which still apply to OneWorld Xe. You should also use this book with the J.D. Edwards manuals that are provided with the OneWorld software.